FashionBeans readers are nothing if not inquisitive – proof of which comes in the shape of the questions that often follow our grooming features. Q: How Do I Get Rid Of Blackheads? A: Blackheads, or ‘comedones’ as they’re known to dermatologists, form in the skin’s pores when its natural oil (sebum) mixes with dead cells and bacteria and hardens to form a plug that eventually oxidizes and turns black. Nice huh? Most commonly found around the nose and chin, where oil production is greatest, they’re not just unsightly but can permanently enlarge the pores, too, so it’s worth preventing them forming. The best way to do this is with a grooming routine that includes an oil busting face wash like Lab Series Oil Control Face Wash, an exfoliating scrub like Molton Brown’s Deep Clean Face Scrub (to keep pores free of gunk) and a clay mask like Baxter of California’s Clarifying Clay Mask, which can be used once a week after exfoliating to hoover up dirt and excess oil. If blackheads do form, you can remove them with special tools like The Body Shop’s Blackhead Remover, but these are fiddly and you need to know what you’re doing to avoid damaging the skin. A much easier (and far more satisfying) method is to use Biore Ultra Deep Cleansing Pore Strips which, quite literally, pull the plug on blocked pores. To make things easier, use after steaming your face over a bowl of boiling water or taking a hot shower – both of which will open the pores slightly. Q: What’s The Best Routine For Washing Hair That Gets Oily By The End Of The Day? A: A lot of guys with greasy hair make the mistake of over-washing it with harsh shampoos and bucket loads of hot water. This is bad news on several accounts. For starters, anything that strips the hair of too much oil will only stimulate the scalp to produce more to compensate. With this in mind, wash hair with a shampoo like Neutrogena T/Gel Shampoo For Greasy Hair, which is specifically designed to remove excess grease but not strip the scalp of the oils it needs to stay healthy. If hair is very greasy, apply to dry hair and massage in before you add water. Greasy hair will still benefit from a conditioner, but opt for a lightweight one (like TommyGuns’ Sage, Basil and Yogurtene Conditioner), only use a small amount and concentrate on the ends of the hair where it’s driest, rather than at the roots. How you treat hair after washing is also important. Since both heat and friction stimulate oil production, always blow dry on a cool setting and avoid fiddling with your hair too much or over-combing when styling. It’s worth having a dry shampoo like Bumble and Bumble Pret-a-Powder in your grooming armoury too – they’re great for those times when you need to de-grease in a hurry and don’t have the benefit of shampoo and water. Q: I’m Looking For A Long-Lasting Fragrance That’s Fruity And Summery. Any Suggestions? A: One of the problems with ‘summery’ scents is that they’re generally big on fresh and fruity citrus notes, which are notoriously volatile and don’t last very long on the skin. What you need for longevity are fragrances with notes like patchouli, vetiver and amber that have a little more staying power. Bear in mind, too, that your individual skin type will play a part in how long a fragrance lasts, with oilier, well-hydrated skin tending to hold on to the scent better. A few fresh, summery fragrances with staying power include Dior’s legendary Eau Sauvage, Balmain’s Monsieur and Frederic Malle’s Cologne Indelebile. The new Paco Rabanne 1 Million Cologne – a much fresher version of the best-selling 1 Million – has tenacity on the skin as well. And if you’re looking for something fruity, you might want to investigate Boss Bottled, which is famous for its big, juicy apple note. Q: I’m Twenty And Prone To Breakouts. Do You Think It’s Still Advisable To Moisturise? A: The important thing to remember here is that oil and water are two different things, so don’t think that just because you have skin that’s on the oily side (hence the breakouts) it doesn’t need hydrating too. What’s the best moisturiser to use? Well, the trick is to go for one that’s lightweight, oil-free and – if you’re prone to blemishes – formulated for spot-prone skin. This way you’ll keep skin plump and hydrated, avoid shine and minimise the risk of developing blocked pores and spots in the process. Luckily, there are plenty of moisturisers out there for oily skin types – Clinique For Men Oil-Control Mattifying Moisturiser, Lab Series Oil Control Daily Hydrator and Murad Blemish Control Skin Perfecting Lotion amongst them. Q: With Summer Coming Up I’m Starting To Get Worried About Sweaty Armpits. Are There Any Special Deodorants To Deal With This? A: Standard antiperspirants can deal with most underarm sweating but if you want something a bit more powerful or suffer from hyperhidrosis – a medical condition where the body produces far more sweat than is necessary – you might want to look into products like Driclor Solution, which has been specially formulated to tackle excessive sweating by blocking the sweat glands. For best results, it should be applied at night. Shaving your armpits (or at least trimming back the hair a little) helps, too, since hair is a breeding ground for the staphylococcus hominis bacteria that feed on the chemicals in sweat and cause nasty smells. Q: Any Affordable Moisturiser With SPF You Can Recommend? A: By now most of us are aware of the damage the sun’s rays do to the skin: along with smoking and sugar, they’re its worst enemy. What’s not often appreciated, however, is that skin is under UV assault all year round – even in winter. Which is why a moisturiser with a built-in sunscreen is a daily grooming essential. 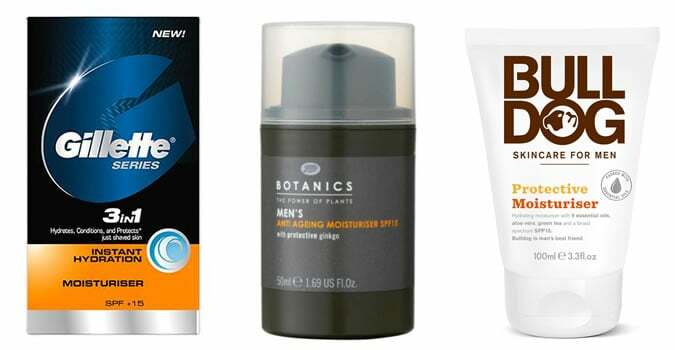 Although they are often pricey, affordable versions that come in under £10 include Gillette Series Instant Moisturiser SPF15, Boots Botanics Anti-Ageing Moisturiser and Bulldog Skincare For Men’s new Protective Moisturiser. Q: How Can I Encourage Beard Growth And Overcome Patchiness? A: Despite what you may have read about miraculous ways to make your beard grow faster or thicker on the internet, there’s not a lot you can do to alter what nature has (or hasn’t) gifted you on the facial hair front. One Cambridge University scientist claimed that beard growth speeds up with the anticipation of sexual activity, but there’s little concrete evidence of this – don’t let that stop you testing out the theory though! In many cases, small patches in your beard will be filled in once the hair above them reaches a decent length. Blow drying the hair with a brush can also help, but in reality the best solution is to learn to love your beard’s little imperfection as you might a pet’s fussy eating habits or your favourite football team’s inability to score when it really matters. Hard, I know, but worth giving a go. Do you have a burning grooming question you’d like answered? If so, use the comments box below.